Yesterday’s oil and gas task force was interrupted by a band of fractivists who intentionally or unintentionally revealed the true nature of the anti-industry groups. 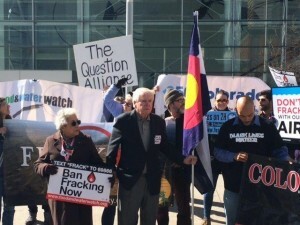 The newly-formed group, Coloradans Against Fracking, held a press conference the oil and gas task force meeting announcing the group’s intention to put a statewide fracking ban on the 2016 ballot. Of course, since the group is not registered with TRACER, we don’t know who is behind this effort, but the rumor is Food and Water Watch. Perhaps you remember Food and Water Watch’s Sam Schabacker from earlier this month when his group laughably was crying “environmental racism”. According to Energy-in-Depth, “it’s the latest rebranding of an environmental campaign that’s so extreme it attacks other environmentalists for not being extreme enough.” To which we say – please, please, please continue beating each other up, all the way through 2016. What was really interesting yesterday was that the group called the task force a “ruse”; yet, no recommendations had been voted on at that point. Did Gwen Lachelt, the co-chair of the oil and gas task force, tip off her friends that the votes were not there for her extreme measures? Who are the science-deniers now?